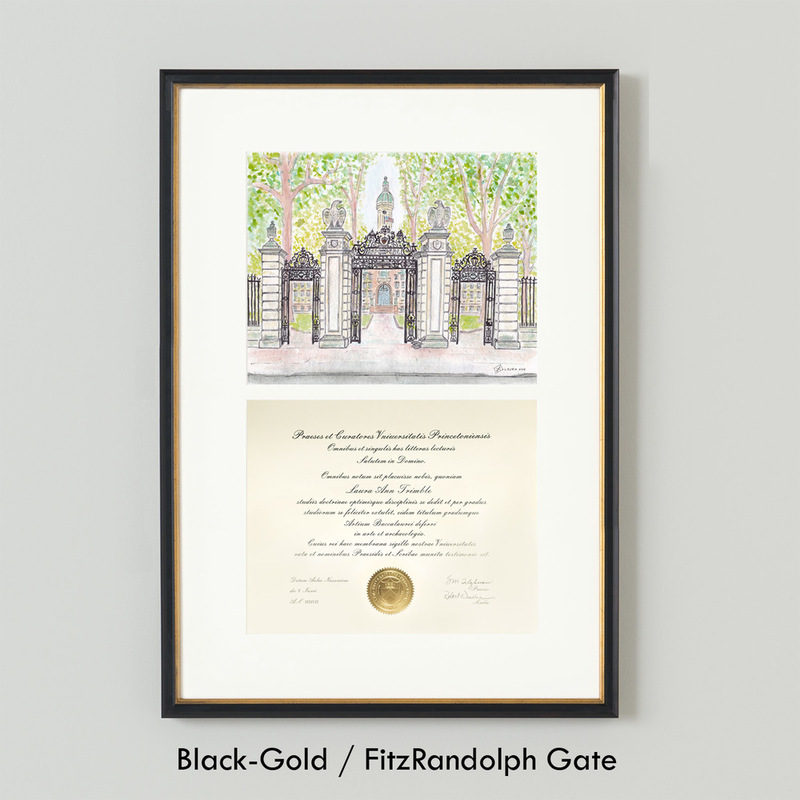 LAURA ANN is pleased to offer a contemporary and design oriented alternative to traditional university diploma framing as we announce our collaboration with Simply Framed, starting with the Princeton University campus! An expansion of the Ivy Campus and Chapel Collection of wedding invitations and stationery, Laura Elbogen is now an officially licensed artist of Princeton University. Her signature watercolor and ink style, sharpened during her time in New York City’s fashion and design industries, blends old world charm with the modern day. 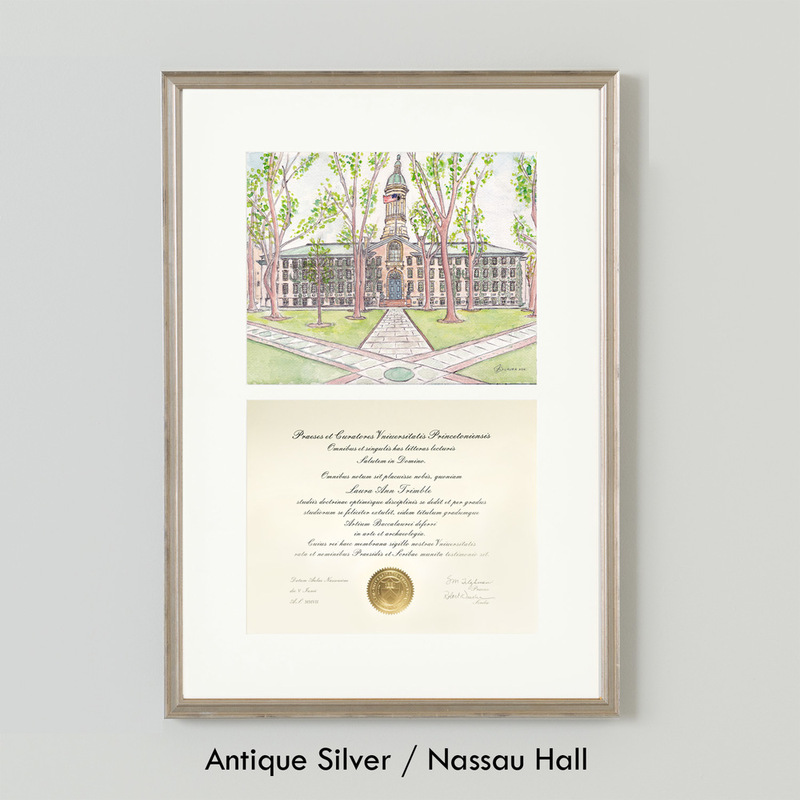 What better way to keep your college memories alive than a watercolor and ink print of a cherished campus landmark framed alongside your diploma! Select your favorite campus print from the following Princeton University landmarks, printed as an 8.5”x11” giclée print and signed by the artist. Are we missing your favorite landmark? Commission an original painting. We've partnered with Simply Framed to offer high quality custom framing made by hand here in the USA! Select from Antique Silver or Black-Gold. Keep a lookout for a mailer from LAURA ANN/Simply Framed. Drop your diploma in the mail to the framer and we will get to work! 2-3 weeks from receipt of your diploma. We will send you a mailer within a week of your order for you to drop your diploma in the mail to the framer. Please account for a 4-5 week turnaround all together. For custom artwork, please allow an additional 2 week turnaround to your diploma framing order (6-7 weeks total). We will send a confirmation e-mail with tracking upon shipping of your frame. Artwork Copyright Laura Ann Trimble Elbogen. The depicted indicia (trademarks, designs, logos) are owned and protected by The Trustees of Princeton University and have been reproduced with permission. Copyright of artwork prepared for the order remains the property of LAURA ANN. Images of the work produced by LAURA ANN may be posted on LAURA ANN’s website, blog, or social media, or other media publications upon completion of the project. If there is a gift or event date associated with the project before which the artwork should not be posted, please notify LAURA ANN. Artwork and design created by LAURA ANN for order may be incorporated into future LAURA ANN retail collections.